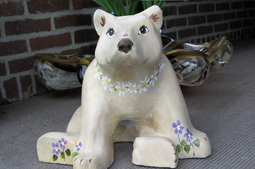 Concrete mini-bears sculptures were created by sculptor Martha Cawley at the request of Bear Fever coordinators Jane and Paul Stahl. 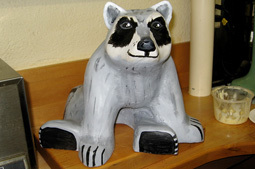 When Martha felt she could no longer fill requests for the bears, Boyertown eye doctor James Tribbett took over the project and takes order for Bearitas upon request. 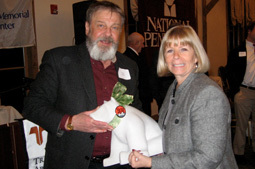 Dr. Tribbett, a loyal patron of the arts generously offers Bearitas to the Bear Fever project as a way to show his support for the arts and local artists. Bear Fever is most grateful for his efforts! 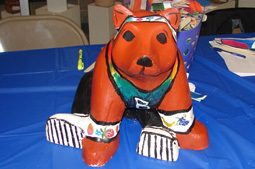 Some of those who have adopted Bearitas have shared photos with us. 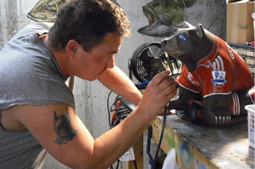 Paul gifts Dale Mahle, retiring president of TriCounty Area Chamber of Commerce, with Oliver--unpainted. Dale was instrumental in the early promotional efforts of Bear Fever. 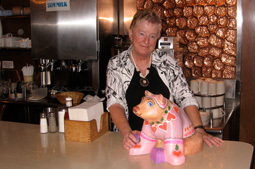 The theme for Boyertown's Progress Dinner 2004 was Bear Fever and featured the first two raw bears sponsored by TriCounty Area Chamber of Commerce as an introduction to the project. The event "kicked off" the project; the rest is history.